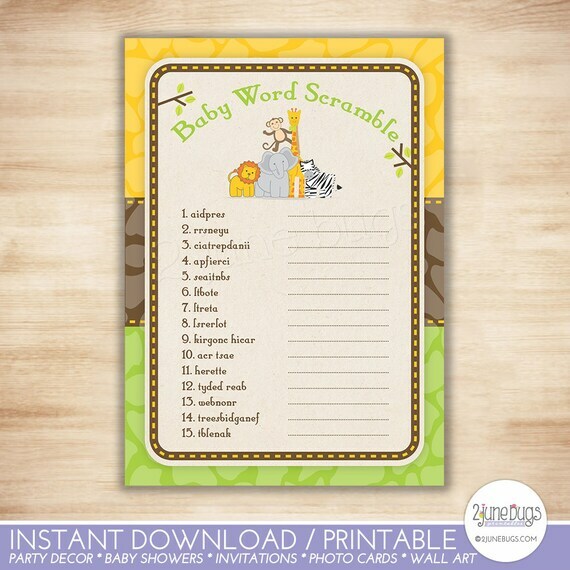 Thank you so much for viewing our printable Word Scramble Baby Shower Game in our Safari baby shower theme! These cards are available to download immediately, so you can actually purchase and print them in the same day - no waiting! For this fun baby shower activity, have your guests guess what the scrambled words spell. (Answer key is included!) The winner is the first person to complete the list! ✶ What's in Your Purse? ✶ Who Knows Mommy Best? ✶ How Big is Mommy's Belly? Etsy will notify you via email that your order is available for download and how to access it once your payment is received. Or, you may log into your Etsy account and go to your "Purchases" page where you will see all of your Etsy orders. Locate this order and you will see the corresponding order download link. If you are on the Etsy app, this functionality may not be available to you. You may need to log into your Etsy account from a browser on your mobile device (or computer) to access your download link and order files. ✶ Online photo printing companies such as Snapfish, Shutterfly, etc are *not* able to print PDF files. If you need or prefer printed cards, we can do that for you as well! Simply send me an Etsy message (click the "Ask a Question" link above) or send an email to orders@2junebugs.com with the item description and I will reply ASAP with details on how to place your order! ✶ This is an "instant download" listing which means you purchase the design as displayed in the listing image. For a personalized item, please purchase from the following listing *INSTEAD*: www.etsy.com/listing/466131641. For changes to an existing design, please contact us (click the "Ask a Question" link above) before purchasing to be sure we can accommodate your request and provide you a custom fee quote if necessary. ✶ Watermark will be not included on the actual file. This is simply to protect our design while being displayed. ✶ This is a digital product. No physical items will be shipped to you. ✶ Please understand since this is a digital product that cannot be returned after delivery, once Etsy alerts us that your files have been downloaded, no refunds will be issued. ✶ This listing assumes the buyer's acceptance of the policies listed in our shop's Policies page. Please view prior to purchasing and don't hesitate to contact us if you have any questions at all! ✶ This listing is for PERSONAL USE ONLY. You may not copy, modify, share or resell these files or designs in whole or in part in any manner.